While many people that were attending Type-A this weekend were stressing for days before the conference as to what to wear, I stood in my closet very early in the morning and stared, not able to pick anything out. The first day, I wore a dress with leggings (no picture). The second, I wore a cute top with jeans and got a picture with my friend Roo (she writes at Neon Fresh, and I’d highly recommend you pay her a visit). I got quite a few compliments on my top (yay, for a preggo, I’ll take what I can get), but then standing next to gorgeous Roo and her thick and wonderful hair, I realized something. The hair, mine, that hasn’t been cut in close to a year (plus or minus, whatever, it’s freaking long and it kept getting stuck behind me when I was sitting), needed to be refreshed. My hair has never been that long, and I think for good reason. I’m not a long-haired girl. Saturday, while I was at the conference, my new dress arrived from Shabby Apple. They sent it for me to review, and I thought it was perfect for the last day of the conference. Again, lots of compliments (thank you), but I was done with my hair (which was pulled back by now). En route to my house from the conference, I called the hair salon, totally on an impulse (in which I work best) to see if they had any openings. Success. They had one in one hour, which was pretty much exactly the time I needed to get home. I took it! I left the salon about an hour later, and with 5 inches less of hair. Thank goodness. My neck already enjoys the slight bit of breeze it receives. Not a ton taken off but enough to make a difference in how it looks. Or course, ask me once I’ve had to style it…I’m sure I’ll feel differently. And, I think taking those 5 inches off really helps me rock my Serenade dress. Apparently, this is really my color (I tend to gravitate towards jewel tones) and I really like it. It is pretty true to size (but might need to be hemmed a bit). I was thinking the dress would be cotton, but it’s described as a jersey knit fabric and a little stretchier than cotton. 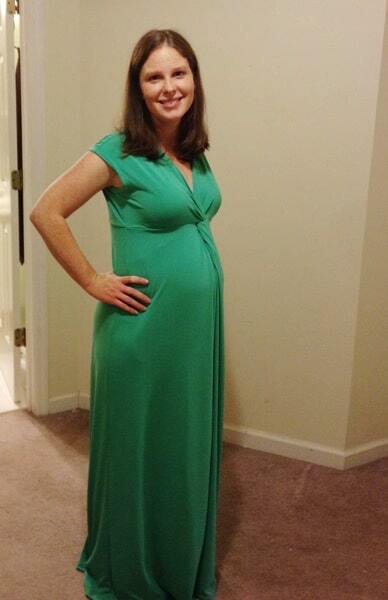 It is not a maternity dress, but at 26 weeks, I had plenty of room to grow and know that I will enjoy wearing it further into the pregnancy and once the babe is here, too. Shabby Apple has a ton of great dresses including vintage clothing for a wide variety of dress needs. Take home message? Make sure you take time for yourself and take time to do things that make you feel good about yourself. Us moms forget to do that and it’s really important! *I paid for my haircut with my own dollars! I received the dress to facilitate my review. All thoughts are my own. You look great and you are right that is definitely your color! First, I LOVE that dress on you. It is totally your color! Second, Roo got to meet you. Crazy time jealous. Third, dude, I thought you were tall. Like 5’10. I don’t know why. Just because. I know you’re not though because, though I’m wider, Roo is taller than I am. Check out those crazy detective lady skills! And, you are too funny! Have you seen a picture of me and my hubby together? He’s 6’3″…if I were 5’10” that would make him like 6’8″! (I’m a very average 5’5″). Those are some seriously good detective lady skills…and I assure you, I’m wider than Roo, too! One day we’ll actually get to meet and hug, too! Mom 2.0? Type-A 2014???? Love your hair and the dress! So pretty! Love the dress, and the hair! Such a beautiful mommy! You look SO FRESH! I love it! Great impulse “purchase”. And yeah, that dress is pretty sweet, too! 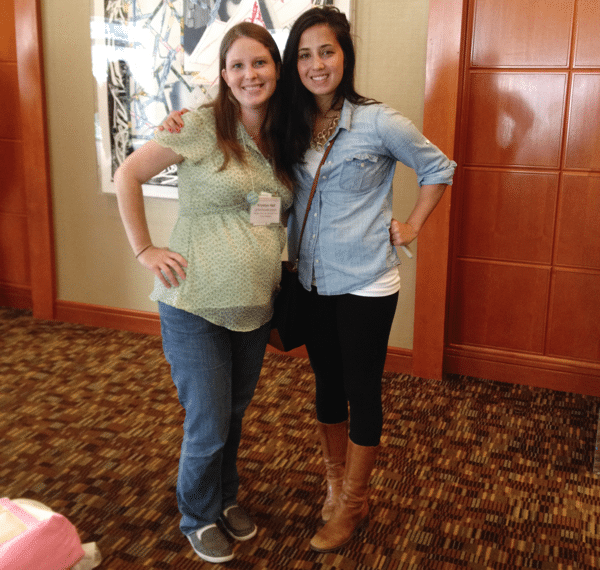 Thank you for being so sweet to me always – you helped make my first conference awesome! LOVE the haircut… and that dress? Looks GREAT!!!! I love the dress. May be long enough for me. Going to check out the website right now. Totally forgot to have Emily try it on. Whoops! Gorgeous! The dress and the hair! I have a similar maternity dress in black. This one isn’t technically maternity, so hopefully, I’ll feel okay wearing it again next year! Love the new hair cut and that dress looks fantastic on you, too! I am feeling over due for a haircut but trying to ignore it for as long as possible! I love, love, love the dress and your haircut! Thanks, Angie! I totally think you would rock this color, too! I thought you looked beautiful every single day!!! Super cute! And perfect dress to wear when you are pregnant. Congrats! Love the haircut and the dress!!! You look beautiful!! Love that dress. The dress was very flattering. The dress is very pretty. Very flattering on you. Love the hair and the dress. Yes, you can hem it a bit for dinner and date nights (if you want). dude loving the hair!! i mean you know how obsessed i was with it so long – but it is super pretty now too!! 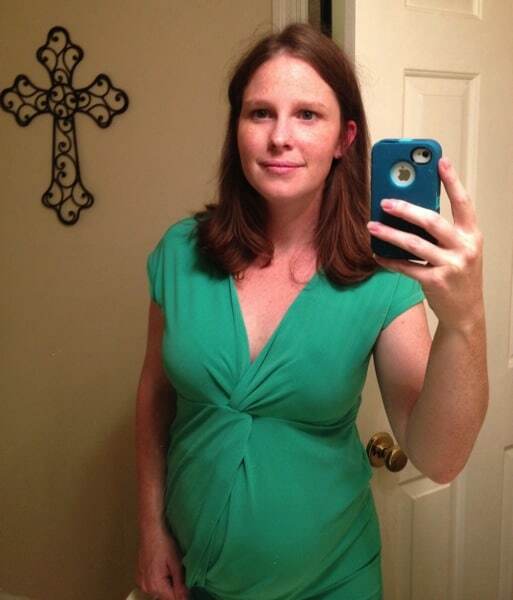 your preggo hair is amazeballs!! Your hair looks great! I recently got my hair cut after not cutting for a little over a year and it just feels great! It definitely feels healthier now! The cut looks cute and that dress and color look great too. I thought you looked fantastic at the conference. Super cute, as always! Awww…thanks, Angela! You are too sweet! Ooooo! I love the haircut! You look fabulous! Thanks, Kat. Yeah, if I have an appt weeks out, I tend to chicken out! super cute! Both the hair and the dress! You look cute! And your new “do” is great. Love the hair cut, love the dress. The color really does look so good on you.